Come visit S And S Inland Star Mercedes in San Bernardino and Highland! We are proud to specialize in Mercedes-Benz Repair. As the premier auto specialty shop in San Bernardino and Highland, our highly-trained automotive mechanics take great pride in supplying: BMW Repair, Mercedes-Benz Service, BMW Service, and BMW Maintenance. Each of our reliable specialists undergo extensive automotive repair training to meet all your auto repair needs. 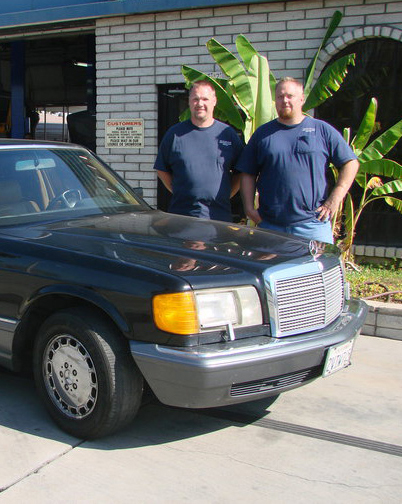 The owners and maintenance experts of S And S Inland Star Mercedes have been honored to serve San Bernardino and Highland, bringing 40 years of Mercedes dealership experience. While we focus on Mercedes-Benz Repair, BMW Repair, Mercedes-Benz Service, BMW Service and BMW Maintenance, we also provide a long range of other auto repair services listed on our services page. Our auto repair experts have built our reputation by providing consistently superior service here in San Bernardino and Highland. No matter what your vehicle needs, come see us at S And S Inland Star Mercedes today! We provide bumper to bumper BMW and Mercedes repair, from Brakes to transmission to engine work, we are the best one stop auto repair shop in San Bernardino and Highland. We provide trustworthy, fast, reliable, and quality work at the right price. Dont just pass through; come see us for any of your auto repair needs. "Sam and Scott r sweet: kind: caring"
"S And S Inland Star is the only place I.."
"A familial setting with excellent follow thru. A cost effective.."
"just as good as dealer service at a substantial saving..."
"S&S has great service and great prices." "SandS always does a good job with very fair pricing..."
"Good group of guys so far the work has been beyond satisfactory"
"The best independent Mercedes Benz mechanics I have found." "Excellent service , very professional and so thrustworthy..."
"Sam is so nice and definitely puts costumer satisfaction ahead.."
"Dependable, honest, great customer service." "I highly recommend this shop, they took care of the.."
"Wonderful service, honest, reliable, reasonably priced, and friendly staff." "Sam & Scott will treat you well, do good work.."
"Quality and reasonable repair work. Honest and great customer service." "They do excellence work, quick and good prices, I always.."
"We are extremely happy with the personal attention we received." "Sam and Scott are really great. Their shop does.."
"They seem to care about their business, seem friendly but.."
"S & S is where all need to go for.."
"The. Best. Ever. Every. Time." "Very good place to take your car for repair and.."
"That they always do very good work and are extremely.."
"I was very pleased, excellent service I highly recommend.."
"Sam and Scott have always been very professional whenever I.."
"Great professional and personalized service." "Excellent service, prices and work." "If you want honest good quality service S &S Inland.."
"Get service from your shop." "I have told people that S and S is a.."
"Very professional .honestly and technically savvy." "Had the awful ABS, ESP, BAS light problem. Took.."
"Excellent, they don’t use aftermarket parts." "Professional, trustworthy, knowledgable, friendly and reliable. My car is.."
"Great customer service. S&S is the only place I.."
"GO TO S & S !!!! They’re the best." "Yes, Sam Thank You for the Great Friendly Service"
"Scott and Sam are the best. They are knowledgeable, fair.."
""Always great service, great people and great results!"" "Great guys, honest, very knowledgeable, reasonable prices." "They are the most honest guys around & their work.."
"Very professional and helpful with a high standard of quality.."
"Very friendly people easy to talk to and you.."
"The best BMW Service I've found since I purchased my.."
"I have been a regular customer for over 10 years..."
"Sam and Scott provide excellent, personalized service. They are truthful,.."
"Excellent quality of work and excellent costumer service!!" "They seem to be honest and knowledgeable in their business..."
"They provide excellent service and always have the car ready.."
"Great people and very helpful what my vehicle needs. Great.."
"Sam and Scott are trustworthy, honest, and friendly men, with.."
"The best place to go if you want honest and.."
"Super honest guys. Quick work and quality service. A+ Will.."
"Very competent and thorough. Does not try to up sell..."
"Excellent service customer is treated with great respect. They are.."
"Don't even hesitate, five star company, five star service." "Definitely take your car there! Honest and reliable. .."
"I have been coming to Sam n Scott for many.."
"they are honest and friendly and do great work"
"Takes the time to explain details and options of what's.."
"I would say. They are my go to guys whenever.."
"This is a honest and professional quality business. I would.."
"Great service, they made sure that everything that needed to.."
"I am very happy and satisfied with the quality of.."
"All is well! Friendly service and very professional." "They do excellent work, reasonable prices, timely! I have referred.."
"great and would highly recommend"
"Best in business. Would never go anywhere else." "Services were good! The owners were friendly and knowledgeable of.."
"That you guys were the best with competent service with.."
"Quality of work is superior and always a pleasant experience.."
"Great service, fair and honest prices!" "Sam & Scott are honest, over a decade of Mercedes.."
"Good fast service and very honest at an affordable price." "I am very satisfied with my service at S&S. I.."
"Excellent service, kept in touch with me about the status.."
"Excellent! I stopped on my lunch hour because my Mercedes.."
"Service is fast, professional, reasonable." "Very high quality and honest reliable service . Qualities that.."
"Sam and Scott are the very best mechanics I have.."
"Excellent work in a timely manner." "For courteous, expert and professional service, Go see Scott and Sam.."
"Great customer service, competitive prices with quality work." "I always receive excellent service, quality work and a good.."
"Its the best shop that i know of anywhere around.."
"Good place to take your car"
"Excellent work and customer service. Experienced and very professional.."
"High quality customer service and trustworthy personel. I would.."
"They are knowledged in older Mercedes Benzes and have very.."
"They would get good and honest service"
"That they can depend on good and honest service." "Excellent work more affordable then dealership. Been working on my.."
"They saved me money in comparison to the dealer's quote,.."
"The shop personnel is knowledgeable, professional and prices are reasonable..."
"They will find the problem to keep you as a.."
"This shop and his owners ares very honest people i.."
"Sam and Scott are two genuine guys. They were up.."
"Helpful and honest. Good work." "Excellent customer service and car care." "Sam and Scott are two highly skilled mechanics who also.."
"Good customer service good affordable pricing"
"Very professional with me. And very honest. I will.."
"Honesty and services was done timely manner." "Go to S & S Inland Star!! They are REAL,.."
"S&S Inland Stars is the only place I take my.."
"I have already recommended them to several friends that have.."
"Great Guy's excellent work fair price!" "High quality work and fair prices.. I switched to S.."
"Excellent, work is good, very friendly.."
"Good guys, good service and reasonable price." "I would 100% recommend them to the most honest and.."
"I would say search no more! S and S.."
"That they are just as good if not better than.."
"I would definitely refer them"
"S and S handled everything professionally with quality service. You.."
"S and S did everything I needed done at a.."
"Excellent Service, great work and they won't oversell you." "was recommended by a friend and had excellent service. Sam.."
"They're very friendly, professional, honest and do quality work." "Sam worked on my car and he is a person.."
"I would definitely recommend S And S Inland Star Mercedes..."
"I totally recommend the to handle your automotive needs." "Excellent, honest guys who really know their stuff and go.."
"Based on this first experience I would strongly recommend this business." "SS Inland Star provides excellent service along with the convenience.."
"Sam and Scott and their team have always been responsive.."
"They are awesome! Knowledgable, reasonable and very trustworthy!" "I would tell them it's the ONLY place to take your car"
"Quality of work and customer service are excellent. They value.."
"The owners have years of experience working on Mercedes'. They.."
"The two gentleman who run the shop are very professional.."
"Great quality of work and customer service. Very professional"
"As usual, the service was done 'top notch quality', timely,.."
"I CAN HONESTLY SAY I HAVE FOUND A COMPETENT AND.."
"Best place to take an aging MBZ"
"Service is great and cost of service is very reasonable..."
"Excellent work at a fair price." "That you guys are honest and trustworthy and you won't.."
"Excellent service and the owners are extremely nice and very knowledgeable"
"I'm happy with the services provided but more important I.."
"I have already done so"
"Great service. Quality work which you can trust--they are honest.."
"I have used S and S for years and I.."
"Excellent shop. Work was completed in short period of time..."
"Quality service, quality work at a reasonable price." "Sam, Scott and the employees are all professional. Your in.."
"that they are timely and they are honest"
"Excellent service. Professional and thorough." "Their work is excellent, the car is ready to go.."
"Sam and Scott, you guys rock. maybe you could subtitle.."
"Please with the service ,would recommend"
"You guys are TOPS and I have had Mercedes for.."
"They offer friendly and exceptional service and won't do anything.."
"That you are great and can be trusted not to.."
"Great!!! They have been taking great care of my Merc.."
"5 stars!! Honest Great service!" "I recommend S&S to all my friends and coworkers! Not.."
"The shop is honest and down to earth owners, very.."
"I was very skeptical about going through these guys the.."
"Excellent customer service, no pressure sales, honest and straight forward.."
"Great work, friendly staff and the price is right :-)"
"They do quality work. Stand by their workmanship." "Good work, friendly service, knowledgable staff at a fair price." "Service, price and time the job was completed was just great"
"Great service and quality work." "S & S Inland Star auto people are honest, informative.."
"Definitely recommend. Honest, diligent and efficient service." "This is the most honest service shop that I ever.."
"this is "the shop you go to whenever you need.."
"Sam and Scott are stand-up guys who provide excellent service.."
"Great and friendly service and I trust that only what.."
"Excellent. I trust S and S Inland Star to be.."
"I have been having my X3 serviced and repaired at.."
"This is a great shop. I was a General manager.."
"Great service! Awesome people. Highly recommended A+"
"of course...I recommend you highly your work and professionalism as.."
"Excellent..I Always quality service w/o long waits. I would recommend.."
"Good service at a reasonable price"
"Awesome!!! Love Sam and Scott they are great, smart, and.."
"One of the most inexpensive and reliable german automotive repair.."
"They care and they are really good and fast service.."
"Friendly owners and mechanics with longevity in this business. I.."
"S and S Inland Star completes quality work efficiently and effectively!" "Great workmanship. Quality customer service. Way better prices than the dealership"
"I have always received quality service and have recommend the.."
"We've been going there got years and inland star has.."
"This is the best, and by far the most honest.."
"Scott is by far the best mechanic Ihave ever ran.."
"Great quality of work and excellent customer service. I recently.."
"They are honest and trustworthy...do good work and stand behind.."
"Very honest. Not out to rip you off." "Excellent ,knowledgeable, honest an fair"
"the customer service and quality is great"
"Very friendly and very good at answering questions, and excellent.."
"Good service, on time extremly honest and at a fair price." "I would state that they are very knowledgeable, proficient, and customer friendly." "very professional, knowledgeable and excellent service...highly recommendable and easily affordable.."
"It's very, very difficult to find an affordable, honest shop.."
"I would tell them that I have known Sam and.."
"S & S Inland Star Mbz' do wonderful work. The.."
"Reasonable rates(comparatively) and very reliable repair. They really know their business."